On December 9, 1938, a ceremony was held in the main courtroom of the Senate to consecrate the Palace of Justice. 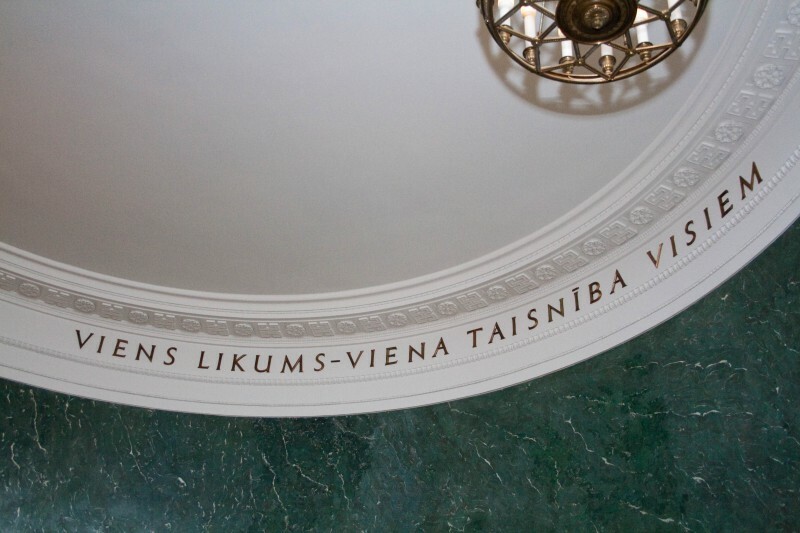 On December 4, 1936, a roll of parchment was placed in the foundation of the Palace of Justice containing the following message: "...Those who have been given and who will be given in the future the post of independent deliverer of justice in Latvia, shall make sure that the sun of justice shines brightly upon Latvian land and the warmth of fairness is not extinguished in its hearth." With the court being considered "an establishment of culture and a feature of culture", Karlis Ulmanis, President of Latvia, in 1936 admitted the need for a new central building for the judiciary - the Palace of Justice, because judicial bodies located in Riga, including the Senate, the Chamber of Courts, and the Riga Regional Court were suffering from shortage of suitable premises. 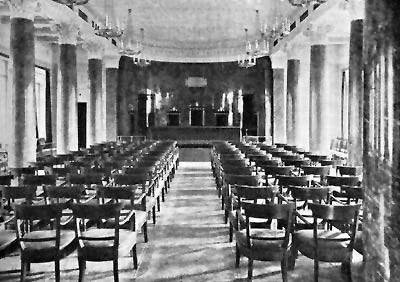 In 1936, the President decided to commence the construction of a new building for the judiciary because the judicial bodies located in Riga, including the Senate, the Chamber of Courts and the Riga Regional Court, experienced shortage of appropriate premises. Initially, several possibilities were discussed to cope with the situation, including the construction of an addition to the building occupied by the Senate and the Chamber of Courts whereby the building would be expended in the direction of Terbatas street. Construction of a new building for the courts in Ravelin Square was also discussed. However, none of these measures provided a complete solution to the problem. At meetings of the Cabinet of Ministers on April 21, 1936 and June 30, 1936, the Cabinet of Ministers decided to allow the Ministry of Justice to construct the Palace of Justice in the triangle between Brivibas Boulevard, Terbatas Street and Elizabetes Street. The Cabinet purchased Ravelin Square from the city of Riga and demolished the building occupied by the Senate and the Chamber of Courts. A contest was announced for the development of the most appropriate project. Architect Fridrihs Skujins was assigned the task of finalizing the project in accordance with the design chosen as the result of the contest and the ideas expressed by the contest committee. The contract for the construction of the Palace of Justice was awarded to the construction company of Mr. Vaitnieks. The cornerstone of the Palace of Justice was laid on December 4, 1936 amidst extensive festivities. The first stage of the construction of the Palace of Justice was completed in less than two years. The first official meeting was held at the Palace of Justice on November 18, 1938 to commemorate the twentieth anniversary of Latvia’s independence. The Ministry of Justice, the Senate, the Chamber of Courts, the Riga Land Register subdivision, and other institutions dealing with judicial work took seats in the Palace of Justice. However, the interior work had not been completed at that time. The formal opening of the Palace of Justice occurred on December 9, 1938, according to information found in the Ministry of Justice archives. The Palace of Justice contained 130 rooms, including courtrooms, offices and clerk’s offices. 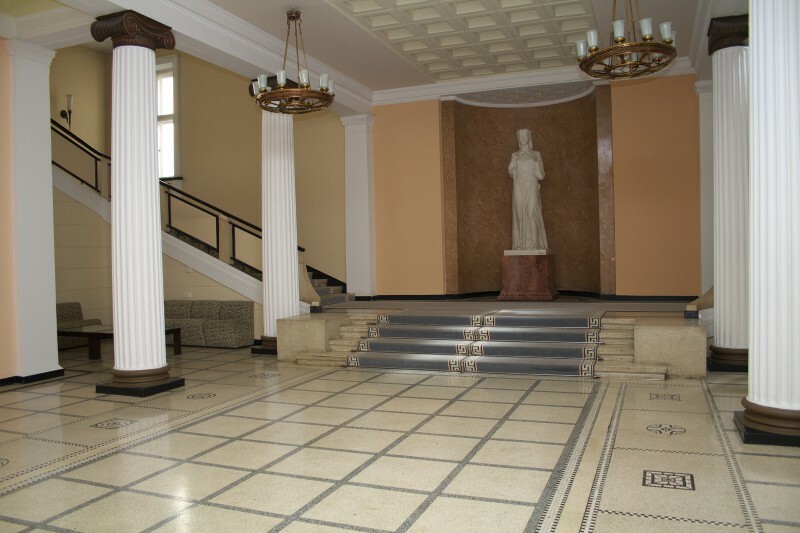 The Senate occupied the second floor of the Palace of Justice. The Senate’s courtroom bore the following inscription: "One law, one justice to all". The siding and sections of the fac,ade of the Palace of Justice are made of Latvian granite. The interior contains details made in accordance with Latvian folk tradition. Construction costs amounted to LVL 2 479 700. The main lobby houses a sculpture made by Karlis Zemdegs entitled "Justice" that depicts a beautiful girl holding a sword and a book of laws. It is believed that the girl is a representation of Laima, the goddess believed by the ancient Latvians to determine a person’s fate, to deliver justice and to allot to each person his or her fair share. Fridrihs Skujins, architect of the Palace of Justice, was Senior assistant at th Latvian University Faculty of Architecture. If the second part of the building, designed for courts of lower instance, was completed, the Palace of Justice would become the seat of all judicial institutions in the capital. However, the architect did not live to see his ideas implemented. When the Soviet regime wound up the Senate in 1940, the handsome premises of the Palace of Justice became home to various Soviet government institutions, such as the LSSR Council of Ministers, the State Planning Committee, and others. The second stage of construction of the Palace of Justice went on, but the rest of the building was put to other use. After the Latvian courts regained their independence, the Supreme Court returned to the Palace of Justice on 23 April 1996. However, part of premises was still occupied by the Cabinet of Ministers, the Ministry of Foreign Affairs, and the Ministry of Justice. The former Senate court room is still at the disposal of the Cabinet of Ministers.